A wine festival Friday-Saturday, with the Tokaj Hegyalja Market on the Sunday! 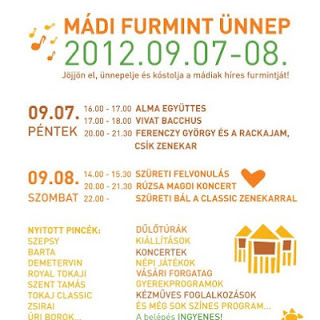 Starting Friday 7th September in the neighbouring village of Mád, a settlement rightly proud of its wines, there will be a weekend of festivity with concerts, exhibitions and gastronomy as part of the celebrations of the Furmint grape, the backbone of the Tokaji wines. Of course the wines themselves are in the centre and, as well as wine dinners and tastings, there is also the chance to join guided tours to the vineyards with the winemakers. Join a vineyard tour to explore the terroir where the grapes actually grow before they continue on their journey to the bottle for your delectation. The harvest is beginning here in Tokaj Hegyalja. Last time at the market it took me a while to realise what one visitor was so outraged about. "But how come there's no grape juice?" he spluttered. I started to explain that Disznókő makes wine, not bottling grape juice, but then I realised from his interjection that he'd just come from the Balaton - a little further south and with earlier ripening grape varieties - and was actually talking about fresh must. But I'm sure there will be fresh juice to taste this weekend in Mád at at least one of the open cellars. The wine festival will give you an insight into this historic wine town, and provide plenty of cultural stimulus too. Then, on your way home on the Sunday why not stop a while at the Tokaj Hegyalja Market to stock up on some local foods and crafts, have a dance and learn something about the mysterious world of mushrooms. An action-packed weekend in a beautiful place. Look forward to clinking glasses with you.